One of the great things about the Nintendo Switch is that it offers you more ways to play: handheld, docked, and the in-between tabletop mode. While handheld and docked mode work perfectly well straight out of the box, however, tabletop mode has a couple of problems that we pointed out in our full review. Fortunately, Nintendo has announced a brand new official charging accessory that will solve some of the Switch’s tabletop woes. The first issue is the console’s kickstand which is flimsy and limited in its movement. Not only does this mean you can only have the screen at one angle when you’re playing, it also means it’s prone to falling. It should be easy to prop your Switch up on a train table during your commute but its kickstand means a slight jolt or particularly heavy footstep will send it sprawling. The second issue is the placement of the Switch’s charging port – it’s right on the bottom of the console so you can’t plug a USB-C charging cable in and play in tabletop at the same time. The new Adjustable Charging Stand tries to solve these problems for tabletop fans. 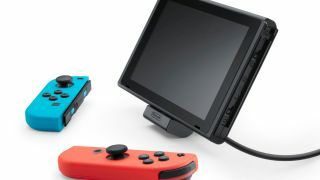 Not only will it allow players to charge their Switch while in tabletop mode thanks to a USB-C slot in the side, it has an adjustable stand on the back which will allow you to set the screen at less hunch-inducing angles. While there are some third-party solutions out there already, which include an elevated-but-bulky stand from Hori, Nintendo’s official solution is more convenient. The Adjustable Charging Stand will be released in the US on July 13 for $19.99. UK and Australian availability is yet to be confirmed but we will update with price and release information when it’s announced.